Charles Saunders Moulthrop was born on July 19, 1935 in Bay City. He was educated in the Bay City public school system and graduated from Central High School in June of 1953. He also completed a course at the Bay City Junior College. Youthful activities included Cub Scouts and the Boy Scouts. He attained the rank of Star Scout. He enjoyed sailing and by 1959 he began racing with big boats. In 1967 he piloted the first boat across the finish line and won a class “B” rating in the Port Huron race to Mackinaw. By 1975 he placed third in Division 1, Section 2. His next goal was sailing from Chicago to Mackinaw. He has at least 119 trophy wins. While in high school he played the saxophone in the school band and orchestra and played with at least two dance bands. He started swimming competitively during his freshman year and continued this activity for four years in high school and three additional years in the same activity for Junior College and one additional year for the United States Army Swim Team. He was still in Junior College when he was named to the All American squad for two events. He volunteered for the service and took basic training at Fort Leonard Wood and from there proceeded to Fort Bliss, in El Paso, Texas and graduated from the Light AAA Gun Mechanic School. He was stationed with the Battery A of the 168th AAA Battalion and then went on to graduate from the 4th Army N.C.O. Academy. He received an honorable discharge and then served for two years in Bay City with the reserves. He has five children. Two daughters and a son, from his first marriage, and two daughters from his second marriage to the former Nancy Ann DeWyse. He was active in the hardware industry and was an officer of the Bay City Hardware Company. He retired as a Vice President in 1979. He was the Past President of the Downtown Bay City Kiwanis Club and the Bay City Good Fellows in 1976. He is a member of the Tawas Bay Yacht Club, the Great Lakes Cruising Club, and the United States Yacht Racing Union. He was a member of the Bay City Junior Chamber of Commerce and a member of the Bay City Chamber of Commerce. He was raised as a Master Mason on October 30, 1962 in Joppa Lodge No. 315. He served in several offices and was elected Worshipful Master in 1967 by Joppa Lodge No. 315. He served as High Priest of Bay City Chapter No. 59, R.A.M. in 1976 and is now the Iosco Chapter and a member of Sun Rise Council Under Dispensation, R. &. S.M. and Bay City Commandery No. 26, K.T. He was Commander in 1985. He also holds membership in the Bay City Scottish Rite Bodies and was active on the 13th and 30th degree teams of the Scottish Rite Valley of Bay City. He was coroneted as a 33º Mason in September 1984. He is also a member of Elf Kurafeh Shrine Temple, A.A.O.N.M.S. of Saginaw. He was also a Past Patron of Sharon Chapter No. 20, Order of the Eastern Star and the 2nd Vice President of the Saginaw Bay County Association of Eastern Stars. He is a member of Madison Court No. 11 Order of Amaranth and was a Grand Royal Patron. He served a three-year stint on the Board of General Purposes representing District No. 24. 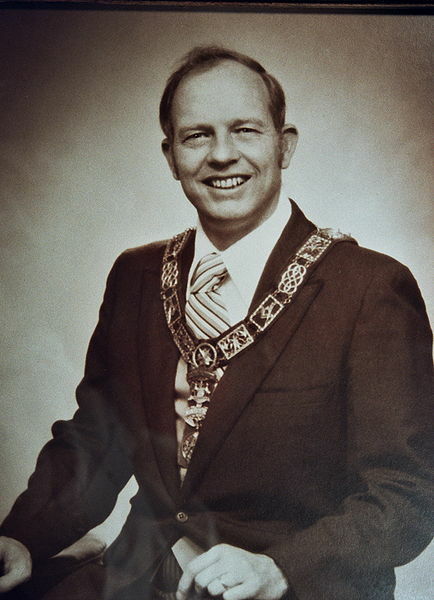 In 1973 he was named Grand Marshal and has steadily advanced through the respective offices until 1979 when he was named Grand Master of Masons in Michigan. In February 1981, he was present at the formation of the Grand Lodge of Alaska, and acted as the Grand Secretary for the installation of their first Grand Lodge set of officers. For 25 years, he has been a dual member of Glacier Lodge No. 10 in Anchorage, Alaska. We interviewed Worshipful Brother Charles on February 6, 2012 at the WKTV Community Media Studios in Wyoming Michigan.